Julian Lennon has been named patron of an organization that wants to raise awareness of the effects of plastic on the environment. The Plastic Oceans Foundation is a UK charity which has been established to provide a powerful and effective platform that wants to change the world’s attitudes towards plastic. Plastic Pollution has become a man-made global catastrophe. Over the last 60 years plastic has become central to our lives and as a result mankind has subjected the planet to a tsunami of plastic waste. The scale of the problem is exponential. 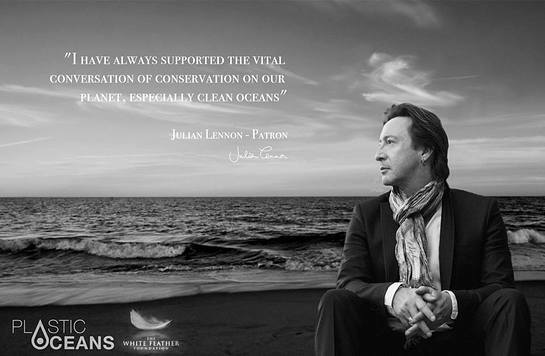 “I have always supported the vital conversation or conservation on our planet, especially clean oceans,” said Julian. Plastic Oceans has assembled a team of the world’s top scientists and leading film makers to produce a powerful, high-end documentary in high definition ‘A Plastic Ocean’. This will play a key role in sending out the message to the world. The team is headed up by film producer Jo Ruxton who was involved in some epic programmes in the past including groundbreaking productions such as Blue Planet, Pacific Abyss, and LIFE. She brings years of experience of working within the BBC Natural History Unit on wildlife documentaries to the Plastic Oceans programme. Accompanied by scientists, conservationists and engineers, the film follows the journey of two explorers as they travel to some of the most remote parts of the world, documenting the environmental issues associated with plastic pollution and its impact on the environment, ecosystems and human health. To find out more, visit PlasticOceans.net.